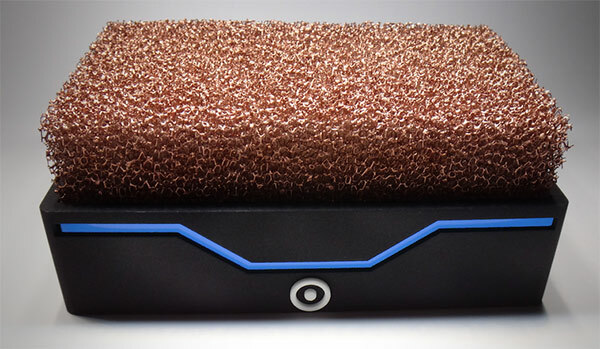 We covered the launch of the fanless 'high-end' copper foam cooled PC project by Silent Power at the end of last month. Now this fascinating crowdfunded project has been fleshed out with actual photos of the prototype (rather than renders), more details about how the heat buffer works with the copper foam and news that a DisplayPort connector has been added to the PC's specifications. The Silent Power team write about how they are relieved that their brainchild has arrived in the flesh and works as intended. A manufactured working first prototype is now in their offices and the team will be testing and reporting upon its qualities and capabilities in the coming days and weeks. So we are hoping to see a selection of popular games and creative software tested to give the system a good benchmarking with an eye on the system temperatures – especially as the copper foam cooling is a major feature of this silent PC. Earlier this month Silent Power also detailed the inner 'workings' of the passive cooling system. What we have isn't just a large block of copper foam slapped on top of the custom CPU and GPU board. A diagram, as reproduced below shows that there's a solid copper part with direct contact with the CPU and GPU which is "is designed so that it can distribute the heat evenly to the copper foam". Silent Power calls this the 'Heat Buffer'. Also due to feedback/customer demand Silent Power has added a 4K native capable DisplayPort connector to the specifications of its PC. The team implemented design changes to fit in the port and has confirmed a successful integration into the prototype. Also, spec hounds, Holger Ficht from Silent Power wrote to me with the dimensions of the prototype Silent Power PC; it's extremely compact at 16x10x7cm. That's a little wider than a stack of 750 sheets of 80gsm A6 paper. It weighs 1.35Kg. Surface temperature max. 50 °C. The Silent Power team are now a third the way to their funding goal of €45,000. I will update readers when we see some system benchmarks and temperature readings emerge. Does that mean the diagram is wrong? and the prices don't seem right. I wonder how the heat capacity of the heatsink reduces as it fills with dust. Such a convoluted shape is going to be nigh impossible to clean, even with compressed air. I would just stick to hoover nozzle on it from many angles should do the trick. That would prevent it working and the machine would quickly cook. It might work on it's side though.